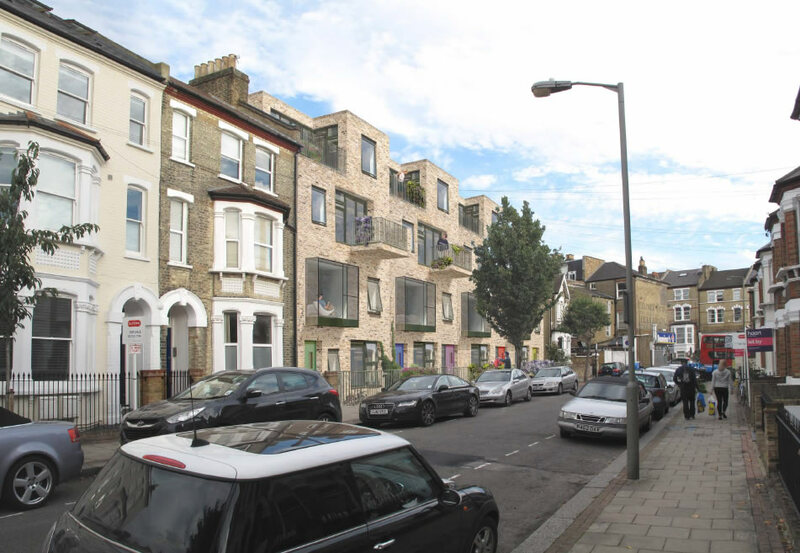 A scheme proposing to replace a few 3 storey small residential blocks in the style of former council houses, with a modern 4 storey building has been approved two weeks ago by Wandsworth Council. The existing building is 8 units – 4 2 storey maisonettes and 4 single storey 1 bedroom apartments with balcony walkway. Each maisonette has a front garden (2m x 3m) and back garden (varying in length, average 9m x 4m). In the summer of 2012, the existing residents of 4-8 Hafer Road bought the freehold of their building from Wandsworth council for under £40,000 and formed a company which 7 of the resident owners are directors. They approached developers to design a new building with 21st century architecture and facilities, and that would allow them to sell additional units from the new block to clear all remaining debt of the residents and make the developer a +20% profit. They also strongly supported the objection of the Battersea Society which said that “the design of the frontage remains out of keeping with its neighbours with obtrusive balconies in particular introducing a jarring note“. The Clapham Junction Action Group and the Battersea Society were supported by about 40 households in the direct vicinity who also objected to the new design. Local residents pointed out that there was no reference to the lack of an independent parking survey from the Applicant. There will be a massive impact on parking from the extra households/residents on such a small street exacerbated by the rack of Boris Bikes planned on an adjacent road. Another issue was the lack of independent Light Assessment (one resident at 10 Hafer road claimed that the assessment submitted on behalf of the Applicants sanctions a 40% loss of light in their kitchen!). Almost 40 local households wrote objections to the design on the Council’s Planning Application website. There were 30 comments in support, with many of them from Clapham South. The Council’s communication of the process of the application, how to object, make comments, and the process of decision making has been pathetic, with many residents being left in the dark about the situation and even when the planning committee meeting was or how to get local council to support their concerns. The Monday before the planning committee meeting on Thursday, some of the local residents discovered, by accident, that the meeting was in 4 days time. The local residents formed an action group and door knocked local residents asking them to partition their ward councillors to attend the meeting on their behalf and express their concerns. “Neighbours said they were left disappointed after their ward councillors declined to speak on their behalf during the committee meeting. Requests were sent to Councillor Peter Dawson, Councillor Jenny Browne and Councillor Martin Johnson for help but the councillors said all they would do is pass on their emails to the committee members. During the meeting, four councillors asked questions and agreed that the development was oversized. Cllr Belton (Labour) thought that the ‘castellated’ design might break up the acknowledged mass density of the build. They did not consider how a flat, squared (rather than pitched ) roof at increased height would further add to the mass imposition of the structure. At the end, only Cllr Heaster (Conservatives) voted against the proposal. There were 3 council officers who were supporting their report but they couldn’t provide any photos or models; they didn’t even have the correct number to hand on how much bigger the development is. Eight of the residents were holding banners against the proposal at the meeting, which attracted laugh from some committee members. After the meeting, the residents of Hafer Road mocked those residents who objected to the building. Post meeting, those residents who are opposed to the design are pursuing other angles of action including obtaining legal advice.